You can thrash, pump, burn and spin all you like at the gym, but if you are not using the power of mental imagery, science shows over and again that you are missing a massive piece of the puzzle when it comes to reaching your body’s potential. The Franklin Method is an approach to movement that teaches you how to use imagery* so that you can engage your brain to improve the way you move your body ( …and your life in general! ). *Dynamic Neurocognitive Imagery (DNI)™ combines knowledge and research from a variety of fields including anatomy, kinesiology, biomechanics and neuroscience to give you an easy to use system at your fingertips that enables you to harness the power of your mind to improve every movement you make. THE FRANKLIN METHOD TEACHES YOU TO USE YOUR BODY IN THE WAY IT WAS DESIGNED TO MOVE. Workshops focus on the practical application of imagery techniques to increase the power, alignment and flexibility of your body. 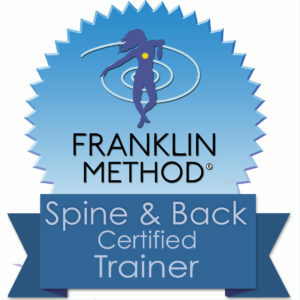 Using in-depth study of anatomy and bone rhythms coupled with gentle focused exercises using bands and balls, the Franklin Method teaches you how to use your body in the way it was designed. you go about your every day tasks. Increase your range of movement in minutes. Check out the events section for upcoming Franklin Method workshops led by Belle. If you run a gym, yoga or pilates studio and want to help your members move and feel even better in their bodies, I’d love to talk with you about being a guest teacher at your space.